For all the sophisticated gadgets I write about, I am most delighted by simple things. I have a favorite Big Red pen, a bunch of number two pencils, a Magic Rub eraser and a few manual pencil sharpeners I got at Disneyland. These are my writing, drawing, and book keeping staples and I delight when I can escape from my computer and use them. When readers commented that they thought the Nose Pencil Sharpener was neat, I thought I'd check out some other developments in the pencil drawer. Here's what I found. Gothic art for the practical at heart, the Sadie Pencil Sharpener is imaginative if nothing else. Though the pencil sharpener regurgitates at the press of a button in the back of Sadie's head, the Sadie Sharpener is difficult to find anywhere, as are the other Living Dead Doll Pencil Sharpeners. The Sadie Living Dead Doll, however, as well as many of the other dolls in the series are available at Amazon.com. First, you need to know about the Smencil, developed in Australia and available in bulk for school and organizational fund-raising activities. If you find someone selling these babies, buy a dozen! 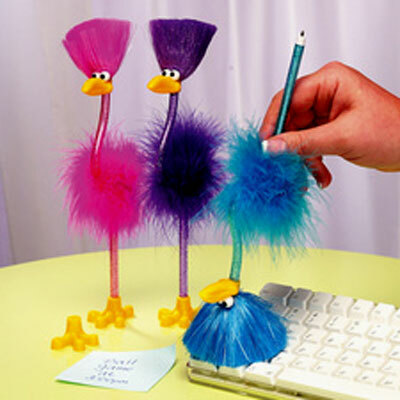 These are revolutionary pencils. Made from recycled newspaper soaked in "gourmet" fragrances, like bubble gum and cotton candy, the Smencils are erasered and stickered. Then each Smencil is placed in its own "freshness tube," insuring that the scent will hang around for at least two years. The original Smencils and the new coloured Smencils come in 10 scents. Find Smencils at Amazon.com. 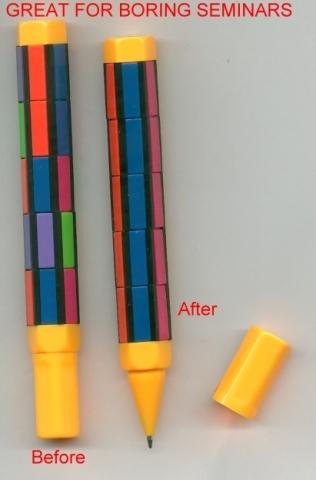 Not for me, I'm addicted to puzzles... so for those who can take it or leave it... the Fascinating Puzzle Pen is available from Amazon and apparently "it's not as easy as you think." Got me right in the chest! Ah, but when you sharpen your pencil in this robot's chest, you're just getting him going -- he'll head right for your finger (or whatever is in front of him). 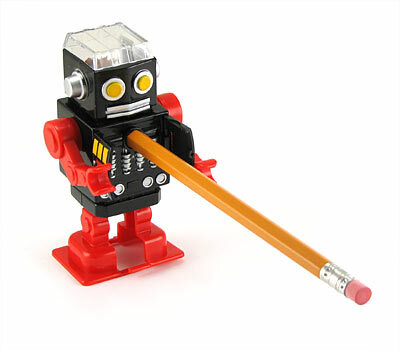 If you use a round pencil you can sharpen it as well as turn on the motor of this sharper robot; if you use a hexagonal pencil, you will turn on the robot but fail to sharpen your pencil; and if you turn the wind up key, you don't have to worry about a pencil at all. At our funny friends at Think Geek. 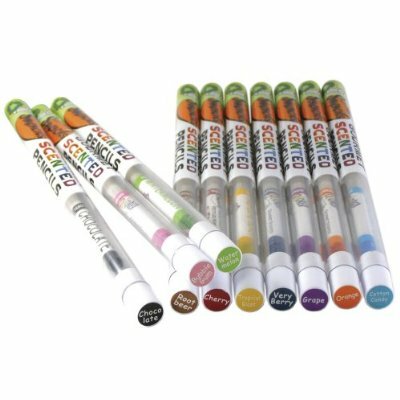 Not revolutionary, but .handy for the artist or doodler, twenty colored pencils are packed together in a sleek metal tube, to be handy whenever you get the urge to sketch. 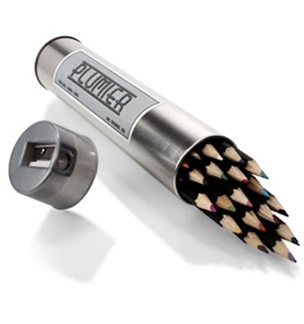 More compact and convenient to carry than the portfolio style cases, the Plumier (pencil case) comes with a pencil sharpener as a lid. No wasted space. Visit Write On and More to purchase. 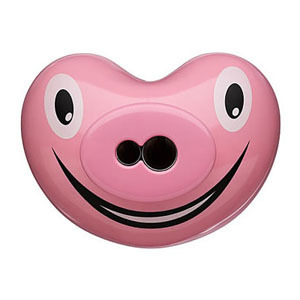 The Italian design house Alessi produces this Pig Pencil Sharpener, by designer Massimo Giacon. Isn't that something? A designer pencil sharpener? Cute lil' thing. Available in pink or red at Lumens.com. 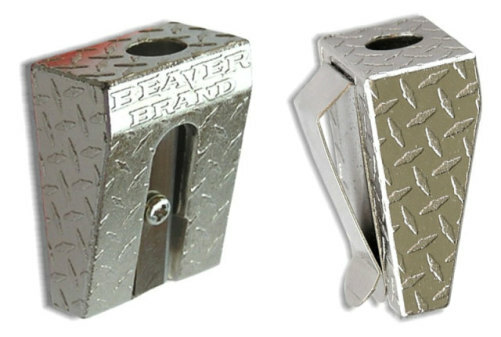 With the carpenter in mind, Beaver Brand created the clip-on pencil sharpener for two kinds of pencils: standard pencils and carpenter pencils. 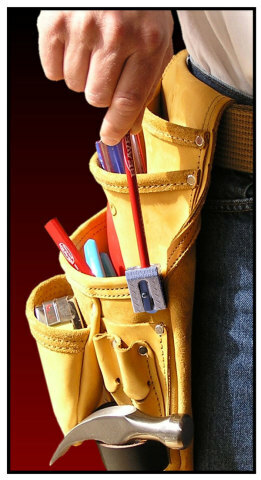 Beaver Brand says the Clip-on Pencil Sharpener is the "best addition to the tool belt since the hammer..." I don't wear a tool belt, but I'd have to agree. I'd like one for my writing board! Visit Beaver Brand to learn more or buy it on Amazon. Do you think it's true that kids are kept so busy in school that they don't have time to chew on their pencils? I think they're just not nervous enough because they're not challenged! For those of you nostalgic about those chewed up sticks, Concentrate Design Ltd. sells four natural wood pre-chewed in a package. 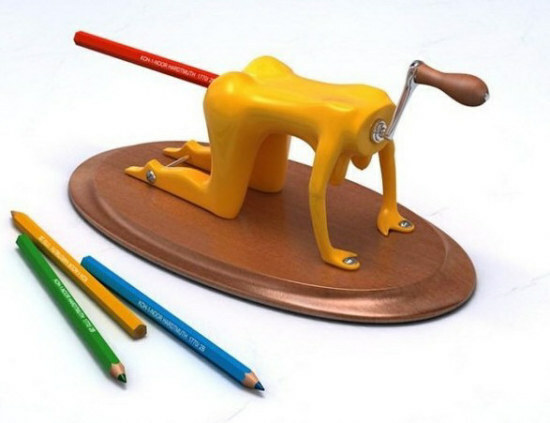 This photo started circulating early this year, and one article suggested that the IRS was going to be selling these pencil sharpeners.... While that was doubtful, I will say I did see one or two advertised privately for sale, but did not want to put that much money where my.... Never mind. Whether it was ever produced or not, the IRS Pencil Sharpener design is certainly worth a mention, because it's so... on point. Enjoy!